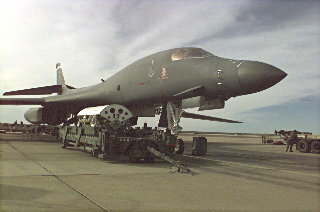 (June 7, 2004) -- A B-1B bomber (like those in file photos on this page) -- which was in LB for a Boeing "Family Day" event open to employees and familymembers but not the general public -- drew noise complaints and triggered "all circuits are busy now" messages on airport phone lines following its afterburner-propelled Monday 10:30 a.m. takeoff. 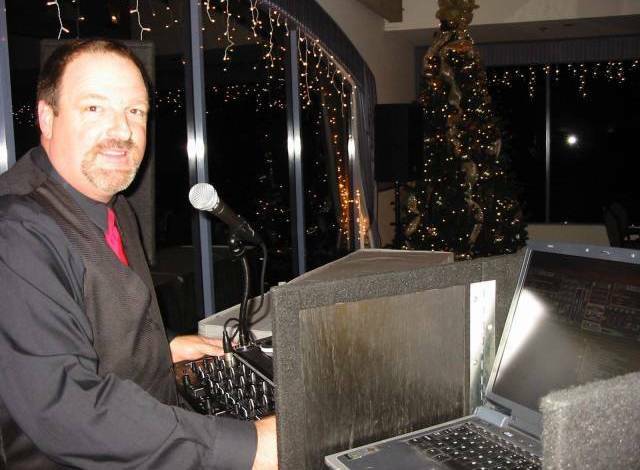 The noise didn't set a record, but was loud: 121.7 dB SENEL [single event noise] at Monitor #9 (just north of Carson St. just west of Cherry Ave.) with a maximum recorded of 114.9 dB for 79 seconds, says LB Airport's Ken Ashmore. The length of the noise got many people's attention. It was a cloudy morning and some speculate the thick local cloud cover contributed to the duration. Two years ago on June 4, 2002, a B-1B taking off after Boeing's "Family Appreciation Day" produced the second highest noise level recorded to that date: 123.6 dB SENEL. 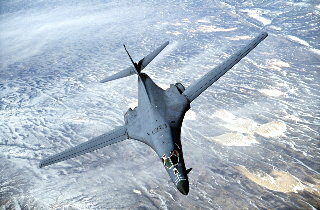 A previous B-1B take off holds the record: 127 dB SENEL. LB Airport's maximum normal noise limit is 102.5 dB SENEL, with each 10 dB increase roughly perceived as a doubling of experienced noise. The B-1B and other military aircraft use afterburners (which are quite loud) on departure to assure a safe takeoff. LB city management, which operates the airport and enforces its noise ordinance, takes the position that military aircraft flights are categorically exempt from the ordinance's noise limits, even when those flights are for promotional, not military purposes. Schools likely to have experienced the takeoff noise included Burroughs, Longfellow, Barton, Addams, Madison, Riley, Lindberg, Sutter, Hughes and Hoover. LB city management alerted media outlets to the B-1B's arrival and departure in advance and encouraged reporting it. The Press-Telegram did so. LBReport.com did not, and advised Airport management of our reluctance based on current homeland security conditions. 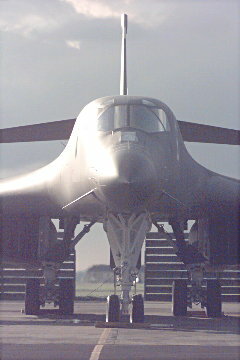 B-1B's were built by Boeing in Palmdale.